Ansonia, Connecticut Fire Department- Fire Marshal Ralph "Ray" Tingley retired from the department on January 13th. Ansonia, Connecticut Fire Department- has sworn in Edward Adamowski as Fire Chief. Ansonia, Connecticut- has sworn in Darrick Lundeen as the new Fire Marshal. Avon, Connecticut Fire Department- adds amphibious vehicle to fleet. CLICK FOR ARTICLE. Bridgeport, Connecticut Fire Department- Provisional Fire Chief Richard Thode has been appointed as permanent Chief. Bridgeport, Connecticut Fire Department- has been awarded a Federal grand in the amount of $219,091 for an Air Compressor / Refill System and Wellness & Fitness Activities. Burrillville Fire Co (Torrington, CT)- has ceased responding to emergencies citing a lack of volunteers as a primary reason. The department will begin dissolving on March 31. CLICK FOR ARTICLE. Burrillville Fire Department (Torrington, Conn)- BFD closes it's doors permanently. CLICK FOR ARTICLE. Canton, Connecticut Fire Department- looks to buy North Canton Fire Station. CLICK FOR ARTICLE. Connecticut- new Fairfield regional fire school christened. CLICK FOR ARTICLE. Connecticut Firefighting Academy- has received a Federal grant in the amount of $361,355 for Air Compressor / Air Refill Station and Training Props. Danbury, Connecticut Fire Department- Lieutenant Albert Mion has retired after 34 years of service. Danbury, Connecticut Fire Department- has appointed Joe Halas as the new Deputy Fire Chief. Derby, Connecticut Fire Department- has sworn in Michael W. Goodman as Fire Chief for a 2 year term. East Haven, Connecticut Fire Department- Fire Chief Douglas Jackson has retired after 30+ years of service. Matthew Marcarelli has been named as the new Fire Chief. He had been serving as Acting Fire Chief in New Haven. Ellington, Connecticut Fire Dept- selectmen cut funds for new fire truck out of budget. CLICK FOR ARTICLE. Fairfield, Connecticut Fire Department- Assistant Chief Christopher Tracy has retired after 26 years of service. Fairfield, Connecticut Fire Department- promotions and new firefighter hired. CLICK FOR ARTICLE. Falls Village (Canaan) Connecticut Fire Department- has opened a new fire station at 188 Route 7. Greenwich, Connecticut Fire Department- 5 new recruits sworn in. CLICK FOR ARTICLE. Groton Ambulance, Connecticut– has been awarded a Federal grant in the amount of $67,044 for 2 – Chest Compression (CPR) Devices and a Diesel Exhaust System. Guilford, Connecticut Fire Department- new fireboat drydocked after electrical fire. CLICK FOR ARTICLE. Guilford, Connecticut Fire Department- has named Michael Shove as Assistant Chief of Operations. Hartford, Connecticut Fire Department- Deputy Chief Daniel Nolan has retired after 34 years of service. Hartford, Connecticut Fire Department- has been awarded a Federal grant in the amount of $619,994 for 119 – Portable and 50 - Mobile Radios. Hartford, Connecticut Fire Department- has been awarded an $11 Million Dollar Federal grant that will allow them to fire 70 firefighters over a three year period. Harwinton, Connecticut Fire Department- has received a Federal grant in the amount of $97,524 for Firefighter Breathing Apparatus. Hazardville Fire (Enfield, Conn)- Firefighter Jason Carlton has been promoted to the rank of lieutenant. 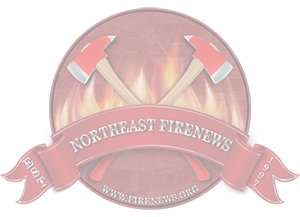 Mashantucket Pequot, Connecticut Fire Department- has named John Marr as the new Fire Chief. Meriden, Connecticut Fire Department- Lietuenant Danny Torres and Lietuenant Mike Fisette have both retired from the department. Middlefield, Connecticut Fire Department- has placed into service a 2017 Ford F-350/Reading as Utility 7. Naugatuck, Connecticut Fire Department- has promoted Paul Russell to the rank of Deputy Fire Chief. New Britain, Connecticut Fire Department- Fire Chief Thomas Ronalter has retired. New Canaan, Connecticut Fire Department- has received a Federal grant in the amount of $14,286 for Vehicle Extrication equipment and a Thermal Imaging Camera. New Haven, Connecticut Fire Department- Battalion Chief Thomas Quinn retired after 31 years of service. New Haven, Connecticut Fire Department- 35 promoted to officer ranks. CLICK FOR ARTICLE. Newtown, Connecticut Fire– has received a Federal grant in the amount of $57,143 for an Air Compressor – Refill System. Noank Fire District, Groton, Connecticut– has received a Federal grant in the amount of $70,858 for 12 – Firefighter Breathing Apparatus. North Canton, Connecticut Fire Association- Seeks to donate the fire station to the town. To date, the firefighters are municipal but the station is still owned by the Association. The station still has a mortgage on it and the town would have to assume payments for the debt still outstanding. CLICK FOR ARTICLE. Northville VFD, New Milford, Connecticut Fire Department- has been awarded a Federal grant in the amount of $323,810, Regional Request for 50 – Firefighter Breathing Apparatus. Norwalk, Connecticut Fire Department- swears in new firefighters including first female. CLICK FOR ARTICLE. Norwalk, Connecticut Fire Department- Fire Chief Larry Reilly will retire this June after 42 years of service. Norwalk, Connecticut Fire Department has been awarded a Federal grant in the amount of $43,619 for 4 – Thermal Imaging Cameras. Poquonnock Bridge Fire (Groton, CT)- has received a Federal grant in the amount of $42,858 for a fire sdiesel exhaust removal system. Ridgefield, Connecticut Fire Department- has named Acting Fire Chief Jerry Myers as the new permanent fire chief. Scotland, Connecticut Fire Department- has received a Federal grant in the amount of $17,572 for Firefighting Hose. South Fire District (Middletown, Conn)- Fire Chief Robert Ross has retired after more than 35 years of service. South Fire District (Middletown, Conn)- Michael J. Howley was sworn in this afternoon as Chief of the South District Fire Department in Middletown, CT. Howley had been serving as Interim Chief of the Department since Chief Robert Ross retired at the end of July. Chief Howley began his career with South Fire District as a volunteer fire fighter. Later he was appointed to the career force and rose through the ranks. For the last few years he was the Department Training Officer with the rank of Captain. As Chief he will oversee a firefighting force of 34 career officers and firefighters. Southington, Connecticut Fire Department- Fire Chief Harold "Buddy" Clark has announced he will retire in February after nearly 40 years of service. Southington, Connecticut Fire Department- has named Eric Heath as Acting Fire Chief. Southington, Connecticut Fire Department- Firefighter Lee Dibble has retired after 30 years of service. Stafford, Connecticut Fire Department- has placed into service a 2008 Ford F-350 former ambulance as Service 145. The unit was refurbished, repainted, and converted into a dive unit. Stratford, Connecticut Fire Department- has received a Federal grant in the amount of $59,091 for an Air Compressor – Air Refill System. University of Connecticut Farmington Health Center Fire Department- will cease operation on June 1, 2017. CLICK FOR ARTICLE. Watertown, Connecticut Fire Department- has promoted Jim DeMarest Jr to the rank of Deputy Chief. West Haven, Connecticut Fire Department– has received a Federal grant in the amount of $45,455 for Turnout Gear Washers & Dryers. West Hartford, Connecticut Fire Department has been awarded a Federal grant in the amount of $551,194 for Firefighter Breathing Apparatus, an Air Refill – Compressor System and Training. West Hartford, Connecticut Fire Department- Assistant Fire Chief Richard Winn has retired after 33 years of service. Westfield Fire Dist (Middletown, Conn)- Firefighter Scott Kotowski was sworn in as the new Deputy Fire Marshal. Westfield, Connecticut Fire Department has been awarded a Federal grant in the amount of $191,800 for 26 - Firefighter Breathing Apparatus and an Air Compressor / Refill System. Westport, Connecticut Fire Department- Fire Chief Andrew Kingsbury will retire March on 1st and will be succeeded by Assistant Chief Robert Yost. Deputy Chief Robert Kepchar is also scheduled to retire on May 31. Westport, Connecticut- town meeting approves funds for new combined fire/police dispatch. CLICK FOR ARTICLE. Westport, Connecticut Fire Department- promotes 13 firefighters. CLICK FOR ARTICLE. Westport, Connecticut Fire Department- has sworn in five new firefighters- Francis Oldham, Joshua Taylor, Andrew Ponticiello, Vincent DelVecchio and Robert Wargo. Westport, Connecticut Fire Department- consultants recommend upgrades. CLICK FOR ARTICLE. Wilton, Connecticut Fire Department- Deputy Chief named Emergency Manager of the Year. CLICK FOR ARTICLE. Wilton, Connecticut Fire Department- Ricky Petrizzi was appointed to the position of Apparatus Supervisor (mechanic). Wilton, Connecticut Fire Department- moves forward with Station 2 renovations. CLICK FOR ARTICLE.